On Aug. 20, the Milwaukee Journal Sentinel and the 10 other Gannett-owned newspapers in Wisconsin published an article from the Wisconsin Center for Investigative Journalism charging that the Republican-led Legislature, in an effort to limit input from the public and Democrats, took significantly less time than in the past to approve laws such as Act 10. Walker administration spokeswoman Amy Hasenberg questions the newsworthiness of the study. “Normally, people criticize the government for moving too slowly. … This must be the first piece I’ve seen criticizing one for getting too much done for the people it serves,” Hasenberg says. But is it? And do those descriptions mean it’s unbiased? The newspaper industry’s decline is well-documented. For more than a decade, it has been hemorrhaging readers and revenue. There are far fewer print journalists than there were just a few years ago. 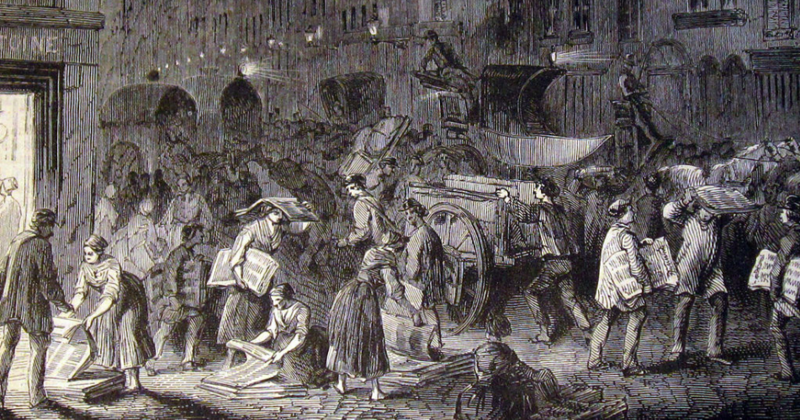 Newspaper downsizings and closings are frequent occurrences. Once-grand newspaper office buildings and their newsrooms are now veritable ghost towns — filled more with memories of clacking typewriters, ringing telephones and bellowing editors than with working journalists. In 1990, nearly 458,000 people were employed nationally in the newspaper industry. By March 2016, there were about 183,000, a plunge of almost 60 percent, according to the Bureau of Labor Statistics. While some national papers such as The New York Times tout increased subscriptions, most large metro dailies are not so fortunate. 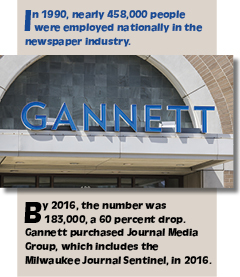 The Journal Sentinel and the 10 other newspapers in the Gannett Wisconsin group — which include the Appleton Post-Crescent, Green Bay Press-Gazette, Oshkosh Northwestern and Sheboygan Press — are no exception. According to Gannett’s statement of ownership, management and circulation published on Oct. 3, the Journal Sentinel’s Sunday circulation has fallen under 143,000. The Milwaukee Journal’s Sunday peak was 600,000 in 1985; the Journal Sentinel’s Sunday circulation after the 1995 merger of The Journal and the Milwaukee Sentinel was 466,000. The Journal Sentinel’s daily circulation is now about 99,000, down from a 1985 peak of 375,000 for The Journal and 328,000 for the Journal Sentinel in 1995. Unofficial totals are even worse, with 134,000 subscribers on Sunday and 82,000 daily, according to newsroom sources. 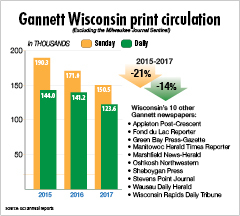 The drop among the 10 other Gannett Wisconsin newspapers has been precipitous as well, with more than a fifth of their Sunday readers lost since 2015. The attempt to shift readers to Gannett’s digital platforms also has been slow going. While hundreds of thousands of print subscribers have been lost, the Journal Sentinel has only 28,000 digital subscribers, newsroom sources say. Nationwide, only 18 percent of Americans say newspapers are their primary source of news, while 78 percent of those younger than 50 say they get most of their news through social media. Fewer journalists and news outlets with dwindling resources mean less coverage and fewer investigations. Nonprofit news operations supported by individuals and foundations, many of which have pet causes or political agendas, have helped fill those gaps. They often offer content to news outlets at no cost. Those stories might not be fully vetted by understaffed and harried editors, who also may be sympathetic to the cause or issue raised in the story, be it gun control, environmentalism or women’s rights. And because of their supposed depth, the stories often run on the front pages, not in opinion sections, and sometimes even in the Sunday editions, where newspapers usually publish staff-produced investigations. WCIJ’s website touts that from July 2013 through January 2018, its stories were printed, published online or aired 742 times by Wisconsin newspapers, television stations and radio stations. The site also states that more than 300WCIJ stories have been published by 600 separate news organizations nationwide with a combined reach of 56 million people since 2009. A search of the Journal Sentinel website shows that the paper has published or reported on WCIJ articles, either in print or online, at least 10 additional times from January through August 2018. Not revealed by the Journal Sentinel, however, is that WCIJ is primarily funded by organizations that closely align themselves with political philosophies or issues typically seen as progressive or left of center. One, for instance, is the Chicago-based Joyce Foundation, a leading gun control advocate in the country. Since 2013, the foundation has contributed $250,000 to WCIJ. The primary funding source for WCIJ for years, however, was George Soros. Soros has been the prime financial engine behind nonprofit journalism around the world. In 2017, the 88-year-old Hungarian-American investor and philanthropist donated $18 billion to his Open Society Foundations. The donation depleted his $23 billion fortune at the time, knocking him down from No. 20 to 59 on the Forbes list of the richest people in America. Soros is a well-known backer of liberal causes and candidates, having given millions to Moveon.org and the Center for American Progress. He spent $27 million in 2004 in an unsuccessful effort to defeat President George W. Bush’s re-election and another $15 million in an attempt to mobilize Latino voters to support Hillary Clinton in 2016. Journalism outlets funded by Soros include ProPublica, National Public Radio, Columbia Journalism Review and scores of nonprofit journalism schools and programs worldwide, including the Wisconsin Center for Investigative Journalism. Acceptance of Soros money by journalists who contend they are neutral has been roundly criticized. In 2010, Soros, via Open Society, donated $1.8 million to National Public Radio. The Columbia Journalism Review said NPR’s credibility was damaged by taking money from “lefty moneybags George Soros,” while admitting that Soros also contributes to CJR. Other journalism operations or groups to which Soros has donated include the National Association of Hispanic Journalists, the Committee to Protect Journalists, Center for Public Integrity and the Center for Investigative Reporting. One analysis estimates that at one point, Soros had spent about $48 million on journalism schools, nonprofits such as WCIJ and like-minded foundations that in turn also fund news projects. Another analysis identifies more than 30 news operations whose boards are populated with editors and higher-ups of Soros-funded organizations. These include The New York Times, Washington Post, The Associated Press, NBC and ABC. An analysis by the conservative Media Research Center says that Soros has helped fund 180 separate journalism-related foundations, publications, nonprofits and other outlets worldwide with a combined reach of more than 330 million people every month. Soros has been a major funder of WCIJ — a fact the average readers picking up a newspaper over the many years that Gannett has been publishing WCIJ articles would not know. Readers would have to go to the WCIJ website to get that information. According to the WCIJ site, Soros’ Open Society Foundations gave WCIJ $185,000 from 2009 through 2011 and upped it to $900,000 from 2012 to 2016, accounting for more than 40 percent of the center’s $2.05 million funding over that five-year period, according to its 2016 tax return. Total contributions to WCIJ in 2017 were $320,857, down from $522,995 in 2016. Donors were not detailed in the 2017 tax return. Current WCIJ funding sources are not listed on its website, but Executive Director Andy Hall says in an email that Open Society Foundations has provided no funding since 2016. “WCIJ hasn’t sought OSF funding since 2016. We are not aware of current grant opportunities there. Hall did not respond to follow-up questions. 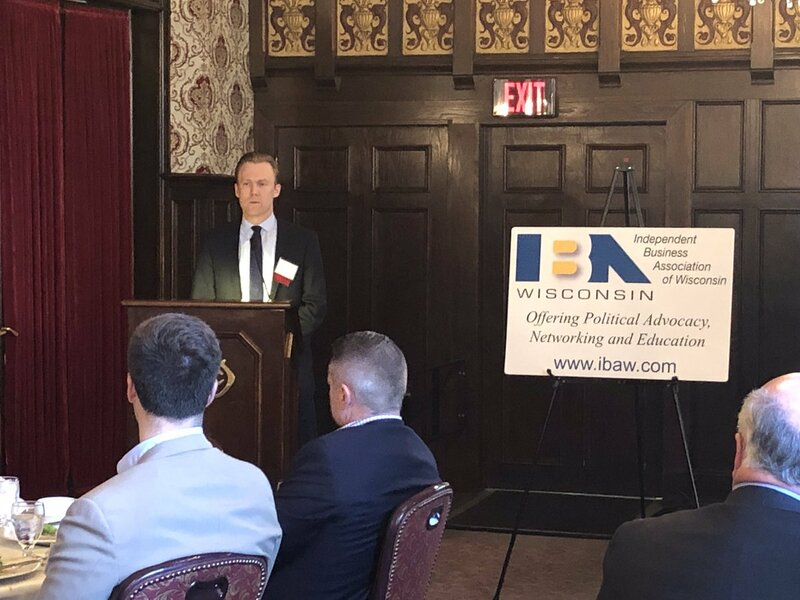 A list on its website of other WCIJ supporters include the Milwaukee Journal Sentinel, Green Bay Press-Gazette, Appleton Post-Crescent, Wisconsin State Journal, Wisconsin Public Radio, Wisconsin Newspaper Association Foundation and Madison television station WISC-TV. 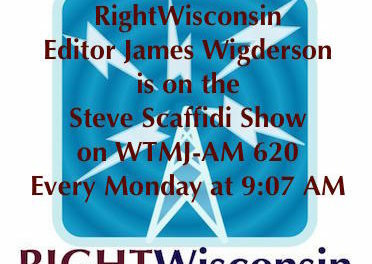 An in-kind contributor is the State of Wisconsin, which donates space for WCIJ offices on the University of Wisconsin-Madison campus at 821 University Ave., 5006 Vilas Communication Hall, home of the university’s journalism program. The offices are offered in exchange for the center’s involvement in training journalism students. 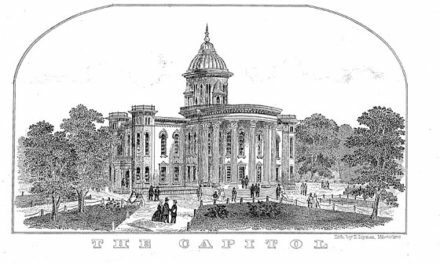 In June 2013, the Legislature’s Joint Finance Committee proposed kicking the center off campus. Gov. 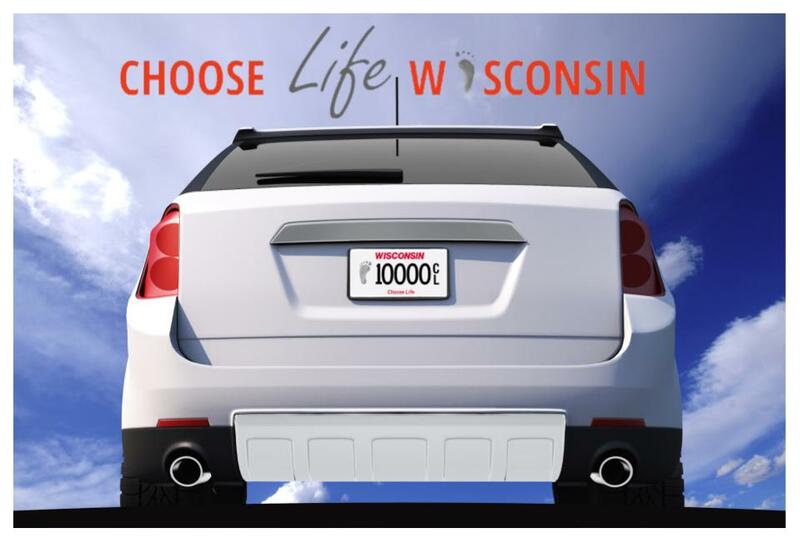 Scott Walker vetoed the decision. Despite its association with UW-Madison and support from Wisconsin news outlets, the vast majority of the center’s money comes from outside Wisconsin. Its largest in-state contributor is the Evjue Foundation, the charitable arm of the self-described progressive Capital Times, according to the WCIJ website. Evjue donated just $20,000 to the center in 2014 and 2015 and increased it to $30,000 in each of the next three years, accounting for less than 10 percent of the center’s funding. Despite receiving much of their funding from left-leaning individuals and organizations, most nonprofit journalism operations, such as WCIJ and ProPublica, say they are independent and not influenced by donors. Yet over and over, their articles are closely aligned with causes and political viewpoints of its donors, including those of Soros. WCIJ is a 501(c)(3) organization, which means it cannot directly engage in campaigning or electioneering. However, the group is legally allowed to have a perspective, and its stories reflect that. 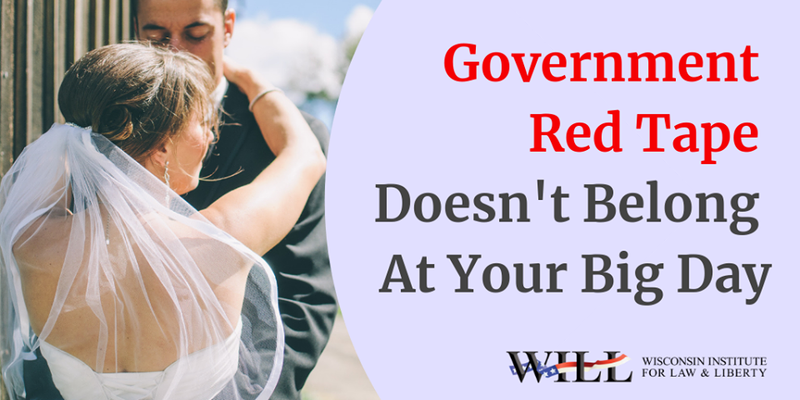 Coverage has been decidedly critical of Walker’s administration. 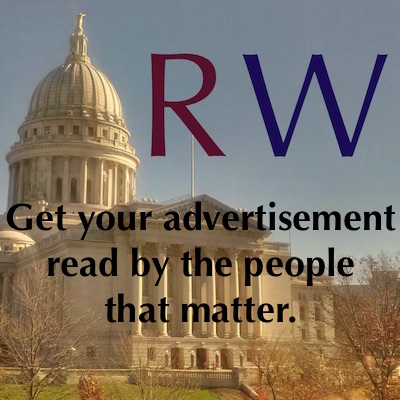 Stories range from documenting troubles at the Wisconsin Economic Development Corp. to the failed John Doe investigation into Walker’s political campaigns by Milwaukee County District Attorney John Chisholm. 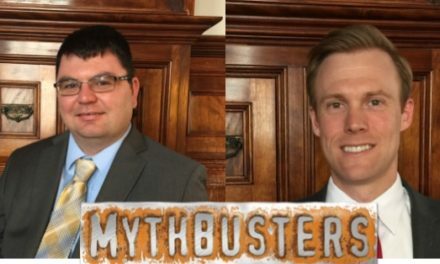 While journalists should critically examine politicians and their policies, and be lauded for doing so, the series included no stories on how the John Doe probe was thrown out and investigators were disciplined or on any positive accomplishments by the Walker administration, such as huge savings for school districts because of Act 10. The series also failed to include any negative coverage of Democratic Party politics or fundraising. WCIJ argues that it is upfront about its funding sources, but its model appears based largely on placing stories in mainstream media publications — and those publications often leave readers in the dark about the source of funding for the projects. Not clearly identifying Soros or other funders would violate a code of conduct for nonprofit journalists developed in a report titled “Ethics for the New Investigative Newsroom,” co-authored by WCIJ’s Hall in 2010. The report urged nonprofit journalism projects to be as transparent as possible about their sources of funding. “(N)onprofit journalism centers must … be transparent about who is funding them, establish guidelines for handling conflicts of interest and communicate with potential supporters to maintain public confidence in these emerging experiments in journalism,” a press release announcing the report’s recommendations stated. Asked whether the center was violating its own rules by accepting money from and not clearly identifying an ideologue like Soros, Hall says the connection has been reported elsewhere. “The OSF (Open Society Foundations) link (on WCIJ’s website) highlights George Soros’ role in funding OSF. Soros’ role in funding also is mentioned in WCIJ’s Wikipedia entry and in previous coverage by such sources as the Milwaukee Journal Sentinel, Milwaukee Magazine, WCIJ, and (former radio talk show host) Charlie Sykes,” Hall wrote in an email. Asked for mentions of Soros on the WCIJ website, Hall suggests searching for him on the center’s site, which turned up links to three columns that appeared in 2010, 2011 and 2013 defending Open Society’s funding of WCIJ and lauding the center for its transparency. Journal Sentinel Editor and Gannett Wisconsin Regional Editor George Stanley says his papers are careful whenever they publish a WCIJ investigation. Yet nowhere does the Journal Sentinel include information on who funds WCIJ, absolving itself because the information is available elsewhere, thus leaving it up to readers to do their own research. For its part, the Badger Institute, which publishes this magazine as well as other journalism and a wide array of policy research, receives funding from many individuals and foundations. Its major funding source for decades has been the Lynde and Harry Bradley Foundation, which, according to its website, supports “the study, defense and practice of the individual initiative and ordered liberty that leads to prosperity, strong families and vibrant communities.” Core Bradley principles include fidelity to the Constitution and commitment to free markets and civil society. 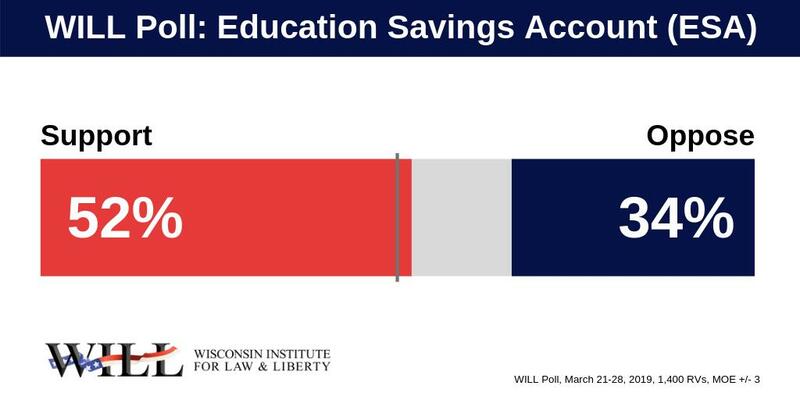 The Journal Sentinel and other outlets have prominently mentioned in news articles the Bradley Foundation as a funder of groups such as the Badger Institute or its predecessor, the Wisconsin Policy Research Institute. Increasingly — whether due to lack of space, lack of reporters, lack of interest or some other motive — the mainstream press does not seem to publish information from Bradley-funded groups, let alone give Bradley-funded groups space for bylined stories. Mainstream newspapers have a different relationship with WCIJ and different standards for describing the group’s perspective and funding. While the papers often publish WCIJ stories, they appear to have never, or perhaps very rarely, disclosed the source of WCIJ’s funding. 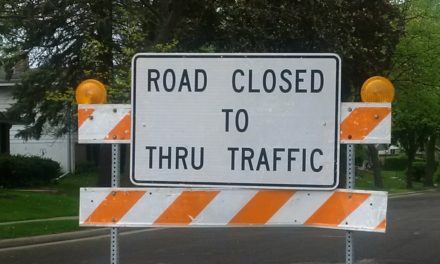 Readers of the Journal Sentinel and other newspapers must dig through the WCIJ website to get that information or even just links to that information. Asked why the Journal Sentinel does not report that fact for readers, Stanley says the newspaper has, offering as evidence a 2011 Daniel Bice column that essentially was a defense of WCIJ after Republicans in the state Legislature complained about its perceived bias. Fred Brown, in his book, “Journalism Ethics: A Casebook of Professional Conduct for News Media,” argues that journalists need to be transparent about their connections and “be up front” about their relationship to funding sources. Dan Benson is a longtime Wisconsin journalist. This appears courtesy of the Badger Institute.